Wynton Marsalis was born on October 18, 1961 in New Orleans, Louisiana to parents Ellis and Dolores Marsalis. At an early age Marsalis exhibited a passion for music. By age eight, he was already performing traditional New Orleans music in his local church band. Four years later he began studying the trumpet and soon performed in local jazz and funk bands. By the age of 14, he performed with the New Orleans Philharmonic. In 1979, Marsalis entered The Julliard School in New York City to study trumpet. However, he met jazz great Art Blakely shortly afterwards and by 1980 was the bandleader of Blakely’s band. 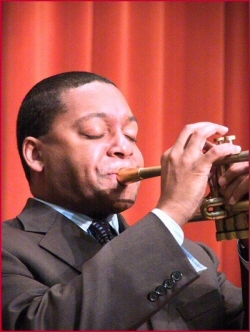 Marsalis became prominent when in 1981 at the age of 20, he became the first person to win Grammys for both a jazz recording and a classical recording. Marsalis also wrote numerous pieces for various musicians including his “All Rise,” which is a composition he intended for jazz bands, symphony orchestras and gospel choirs. To date, Wynton Marsalis has over 40 classical and jazz recordings which have earned him a total of nine Grammys. Some of his work includes “Them Twos,” “Sweet Release” and “Jump Start.” He also co-founded Jazz at Lincoln Center which hosts up to 500 annual events. Marsalis has been named by both Time and Life magazines as one of America’s most influential people. In 2001 he was appointed a United Nations Messenger of Peace. Marsalis continues to spread the word of jazz around the world by donating his talent and time through various non-profit organizations. Stuart Nicholson, Is Jazz Dead? (Or has it moved to a new address) (New York: Taylor & Francis Group, LLC, 2005); http://www.wyntonmarsalis.org/.